The theme of the exhibition encouraged students to think outside of the traditional art “box” and to make art that is not “hot air”, but that means more than just a painting or sculpture. “Hot Air?” includes artwork from Elon students, all hand-selected by an independent jury of three graduate students from UNC Chapel Hill. The jury cut the artwork down from about 80 to 90 submissions to more than 45 pieces now hanging in the Arts West gallery space. Members of the ART 380 Professional Practice class organized and ran the event with coaching from their professor, Michael Fels. “This is an opportunity for the students to prepare for their thesis show at the end of the year,” Fels said. He also commented that students naturally gravitate to the part of the event that most appeals to what they want to do upon graduation, from curatorial work to designing the gallery space to helping organize other artists into a collective group. “It’s a good way to build up a resume,” Fels said. 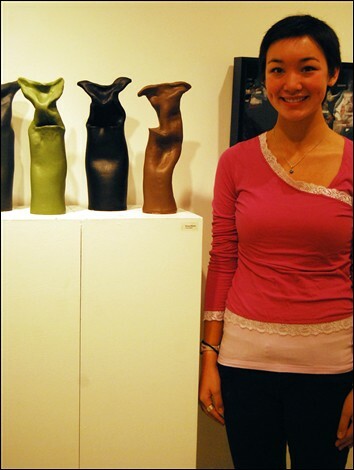 Senior Monica Huang was coordinator of the jury committee, charged with finding the three jurors to judge the artwork. Capozzola said he was surprised at his selection. “It’s an honor to even be included, much less win,” he said. His inspiration for his photograph came from research into photographers like Jeff Wall. “A lot of my photographs have to do with open-ended narratives,” Capozzola said. He said his photography invites the onlooker in to make up a story of his or her own. Capozzola won $50 for his entry. The jurors could not attend the reception, but they left a statement on the doors to the gallery. They said the selection process was difficult because of the volume of talent generated by Elon students. “The students’ art truly rose beyond the expected,” the statement read. “Hot Air?” will be in Arts West until Dec. 1 and is open to the public.